Probability and Statistics in Hydrology treats probability theory and mathematical statistics as applied to hydrology. Probability theory is presented in a summarized form with emphasis on its use in hydrology. Statistically, the emphasis is on inferential rather than descriptive statistics of classical hydrologic applications. Since hydrologic processes in nature are governed by the laws of chance, the use of probability theory and mathematical statistics is unavoidable in the extraction of information from hydrologic data and for the best mathematical description of these processes. This book is not a conventional statistical treatment of the subject. Certain concepts are defined; mathematical expressions are written in a format that is ready to use; techniques are explained, as well as their applications to hydrology (with examples) are presented. 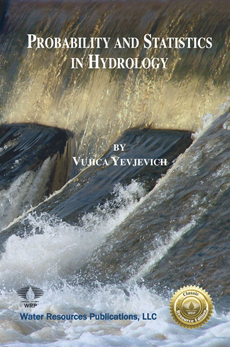 This book is aimed at practicing hydrologists and engineers; graduate students; post-graduate students; and specialist interested in probability theory and mathematical statistics as applied to hydrology. It is now part of WRP’s Classic Resource Edition. Mathematical Expectation, and Variance of Random Variables . . Frequency and Cumulative Frequency Curves of Univariates .